Warning: this is not a post about mathematics. But it might fit into the jigsaw puzzle in the end, who knows! You know what happens when you are making one of those jigsaw puzzles? Of course you do, you spent your childhood doing those. I did as well. I only had a couple of ones with 1000 pieces, so I did them over and over again. I adored the feeling of assembling a story, even the same, one, out of 1000 small, tangible, concrete, cutely shaped individual pieces none of which bore any resemblance to the final picture. I would keep the ready picture for a few days until it started getting dusty or it was getting in the way too much, and then break it up into pieces and put it away in its box until the next weekend. This was often tomorrow. But I digress. What i wanted to say was this: when you are making such a humongous puzzle, the board seems huge, twice as big as it should be or more, and all the pieces don’t fit. There are moments of desperation and triumph, of visual aesthetics, of ambiguity and choice. Jigsaw puzzles to me are one of the most beautiful sensory and mental experiences in the world. And then at some point towards the end, when the picture begins to take shape, the pieces suddenly fit and areas which appeared remote and disconnected, neatly tesselate and intertwine with each other. Suddenly everything fits on the white plastic board which my mother found somewhere in the street once and cut it up into two pieces for me, one for a small puzzle and the other for a larger one. I am the same scrounger as my mum. I walk in the streets picking up various bits and pieces, I love flee markets and second hand shops and pavements. I am a “Sachensammlerin”, like Pippi Longstocking. But I digress again. You know how in the beginning, and also for a whlie longer, all the squares of the puzzle don’t fit, and it’s a big mess, and you have no idea where you are going, but it’s so marvellously disorganised you want to prolong this time forever and not complete the puzzle. I love doing puzzles slowly, bit by bit, savouring every pair of fitting opposite lines. Letting my eyes glaze over the pieces to imagine the picture shaping up in the background. Touching the different shapes, classifying the pieces into similarly shaped and seeking out the odd ones. The odd ones, they are my favourites. I love it so much I often stop in the middle of it, just before I’ve found a mate for a certain piece, just when I am on a wave of finding many fitting pieces. I want to slow it all down, cut the moment in half, stay suspended in mid air beween the first piece and ne of its four long-lost soulmates. Some pieces have fewer than four and others more. But most have four, it is the jigsaw piece nature to have four mates. Just like the flowers of the lilac: they usually have four petals, but if you look long enough, you might find one with only three, and polyamorous ones with five or even six petals. When you find a lila flower with more petals, you must eat it and make a wish. If you find one with less, make sure to forget about it quickly because it is bad luck. Once I found a lilak flower with seven petals. I ate it, of course, although i suspected that pollution from the local oil plant Neftochim might have been the cause. But I digress again. When you’re doing a large puzzle, the pieces don’t fit on the board just yet. But if I could decide how things go, my puzzle would be so large that I would never quite figure it all out to the last bit, and there would always be mysteries and hidden links between disparate pieces. Berlin is exactly a that sort of a puzzle. On the plus side, it’s 3.14 πμ and I’m having coffee (or is that co-ϕ?) 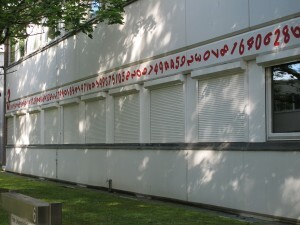 in the π-Building of the Free University of Berlin. How cool is that.